Jyeshta Gauri Pujan is performed in many households during Ganesh Chaturthi festival in Maharashtra. In 2019, Gauri Avahan in on September 5, 2019. Gowri Puja is on September 6 and Gouri Visarjan is on September 7, 2019. 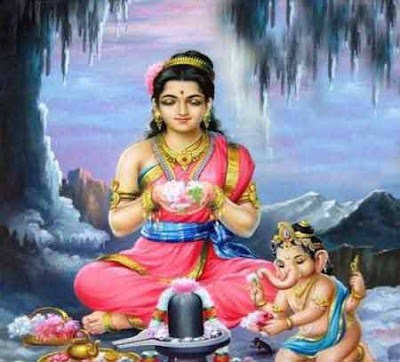 Goddess Gauri is another name for Goddess Parvati, the mother of Ganesha. Arrival of Goddess Gauri in homes is said to bring health, wealth, happiness and prosperity. Two idols of Goddess Gauri are brought home and worshipped and the arrival is regarded as the coming of the sisters of Ganesha by some communities. Some people believe that it is Goddess Parvati, mother of Ganesha. The idols of Gauri are brought usually two days after the beginning of Ganesh Chaturthi. It is placed for three days – first day is the avahana, next day it is the main Gauri Puja and also Satyanarayan puja and on the third day Gauri is immersed in water. Legend has it that the two forms Gauri follow Ganesha to the homes. The idols of Goddess Gauri which are brought in pairs – two different forms of Gauri – are decorated and special pujas are offered. Women also perform the community puja along with Haldi Kumkum ceremony. Goddess Gauri killing a demon is narrated after the puja. Note - Gauri Puja during Vinayaka Chaturthi in certain parts of Maharashtra, especially in Pune, Goddess Gauri is the sister of Ganapati. Many Hindus might raise an eyebrow when they hear Gauri as sister of Ganesha. A Gauri Puja is held the day before or on Ganesh Chaturthi in Karnataka and in it Gowri is the mother of Ganesha. In West Bengal, Goddess Lakshmi and Goddess Saraswati are sisters of Ganesha and all three are children of Goddess Durga. Each region in India has an independent culture and most of these cultures are 5000 years old. Each region has developed its on way of interpreting the deities. But what is common in all regions is the basic idea – all idols are an attempt to give form to the Nirguna Parabrahman. Brahman cannot be defined but each individual has the freedom to make an attempt to define in it. The greatness of Sanatana Dharma lies in this freedom, respecting an individual’s quest to define Brahman and not in imposing ideas.